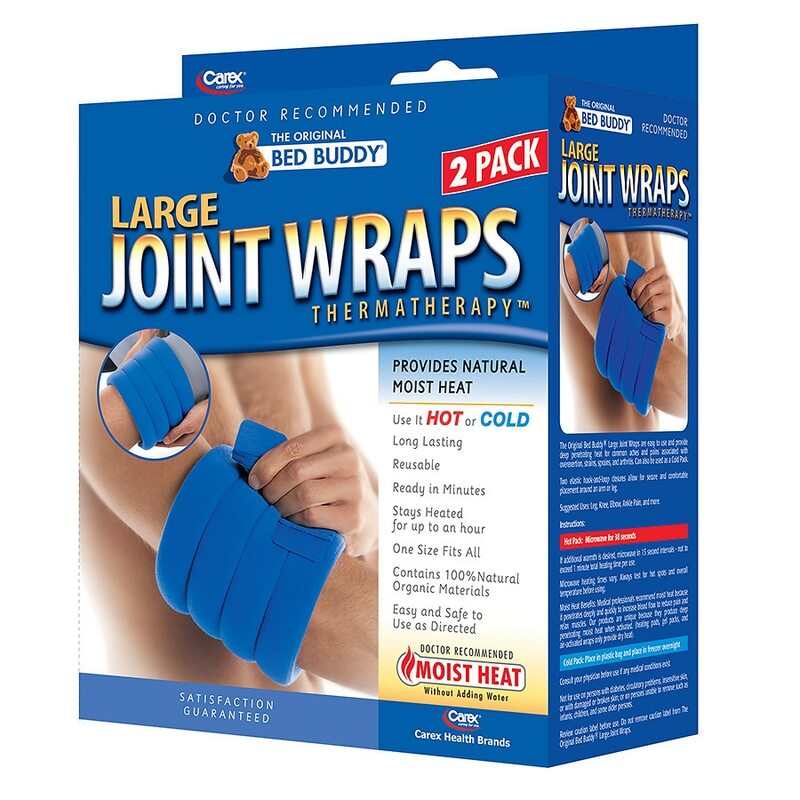 The Bed Buddy® Joint Wraps provides doctor recommended moist heat and is designed to relieve strains, sprains, arthritis pain and carpal tunnel syndrome. The Joint Wrap can offer both hot and cold therapy with a flexible design, fitting comfortably around the wrist, elbow, knee, ankle, arm or leg. Soft touch material and a Velcro strap, to secure the wrap to the pain area, ensuring complete comfort and mobility. A natural alternative or compliment to over the counter drug treatments. Hot Pack: Heat in microwave 30 seconds. If additional warmth is desired, continue microwaving in 15 second intervals — not to exceed 1 minute total heating time per use. Microwave heating times vary. Always test for hot spots and overall temperature before using. Cold Pack: Place in plastic bag and place in freezer overnight. Review caution label before use. Do not remove caution label from The Original Bed Buddy Small Joint Wraps. Consult your physician before use if any medical conditions exist. Not for use on persons with diabetes, circulatory problems, sensitive skin, or with damaged or broken skin or on persons unable to remove this product such as infants, children, and some older persons.